Major Global Volcanoes of the last 200 years. | Chaos Sweeps Away the World We Know! The Disaster, current events & Catastrophe Blog. Forecasts for 2014 to 2022. Read tomorrows news today! Plus current economic, commodities, stock indices and financial news. Major Global Volcanoes of the last 200 years. 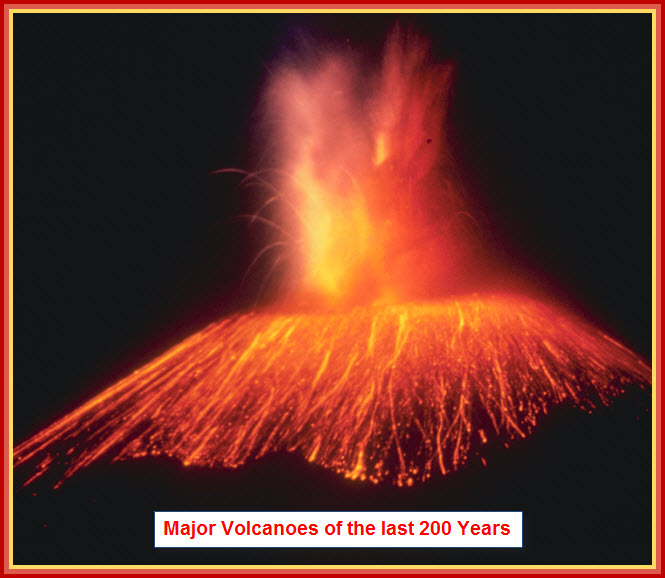 December 3, 2012 – Major Volcanoes of the last 200 Years: The top five major global volcanoes, from 1812 to 2012. The Volcano Explosivity Index (VEI) ranges from 0 (Gentle) to 8 (Colossal), and is the standard measure of a volcanoes power. #1 – Tambora, April 5, 1815; Lesser Sunda Island, Indonesia; VEI=7: After minor eruptions for more than two years, Tambora Exploded with a sound so loud it was heard 1,600 miles away. Ash fell as far as 800 miles from the volcano. The eruption produced total darkness at mid-day 375 miles away. A total of 30 cubic miles of ash, rock and lava were ejected from Tambora in the first 24 hours. That is the equivalent of 400 million 2-Liter bottles of soda erupting every second! The pyroclastic flows covered 12 miles. The tsunami generated by the eruption traveled 750 miles. Tambora itself lost 4,800 feet in height and created a 2,100 foot deep crater. At least 300,000 people died due the eruption and its aftermath. Tambora sent enough pulverized rock into the atmosphere to disrupt weather around the globe for more than a year. The cloud of ash circled the world. Average temperatures dropped as much as 5 degrees Fahrenheit over the next year. Many Europeans and North Americans called 1816 the “year without a summer.” Snow fell in New England and Eastern Canada in June. Europe was very cold and rainy. Ash fell with snow. Rivers flooded. Britain, France, Switzerland and Germany lost harvests and suffered famine. The Napoleonic Wars had caused food shortages, and now there were riots and looting, then an epidemic. Some 200,000 people died in Eastern and Southern Europe from a combination of typhus and hunger. Asia and India experienced heavy monsoons, cold temperatures and frost. Rice production fell. China suffered famine, and India was hit with a cholera epidemic. #2 – Krakatau, August 26 & 27, 1883; Indonesia, VEI=6: Krakatau came to life on May 20, 1883. Eruptions significantly intensified on August 25th and by August 26th a black cloud of ash could be seen by observers that towered 17 miles (90,000 feet) into the sky. At this point, the eruptions were virtually continuous and explosions could be heard every ten minutes or so. Ships within 12 miles of the volcano reported heavy ash fall, with pieces of hot pumice up to 4 inches in diameter landing on their decks. On August 27th four enormous explosions took place. The explosions were so violent that they were heard 2,200 miles away in Perth, Western Australia and the Indian Ocean island of Rodrigues near Mauritius, 3,000 miles away. Each was accompanied by very large tsunamis, which were up to 115 feet high. The explosion was equal to 10 Hiroshima type nuclear weapons. At least 40,000 people died from the eruption. The pressure wave generated by the colossal final explosion was so powerful that it ruptured the eardrums of sailors on ships and radiated across the globe. Barograph recordings show that the shockwave from the final explosion reverberated around the globe seven times in total. Ash was propelled to a height 50 miles (264,000 feet). #3 – Santa Maria, October 24, 1902; Guatemala, VEI=6: One of the largest eruptions of the 20th century occurred at Santa Maria Volcano in 1902. A Captain from the mail boat S.S. Newport, off the Pacific coast, measured the column height of the eruption at 17 miles (90,000 feet). Thousands of people died and most of Guatemala’s coffee industry was destroyed. Ten villages were buried beneath tons of volcanic debris. Over 17,000 people died. Some were by deadly fumes. Ashe was seven feet deep in many towns. Mud, stones, and lava fell all over the country. Houses were crushed by the weight of the volcanic material. Cattle and horses were killed by the thousands. Famine and pests were some of the side effects of this terrible disaster. In Guatemala City it was estimated that 15,000 lives were lost. The exact number will never be known, as thousands lay buried beneath the ash, and their bodies were never recovered. #4 – Mount St. Helens, United States, May 18, 1980; VEI=5: One of the most studied volcanic eruptions in history was Mount St. Helens. On the morning of May 18, 1980— the largest terrestrial landslide in recorded history reduced the summit of Mount St. Helens by 1,300 feet and triggered a lateral blast. Within 3 minutes, the sideways blast, traveling at more than 300 miles per hour, blew down and scorched 230 square miles of forest. Within 15 minutes, a vertical plume of volcanic ash rose over 80,000 feet. The dense ash cloud turned daylight into darkness in eastern Washington, causing streetlights to turn on in Yakima and Ritzville. The volcanic ash cloud drifted east across the United States in 3 days and encircled Earth in 15 days. Lahars (volcanic mudflows) filled rivers with rocks, sand, and mud, damaging 27 bridges and 200 homes and forcing 31 ships to remain in ports upstream. Thousands of birds, mammals, reptiles, amphibians, and millions of hatchery fingerlings perished in the eruption. The May 18, 1980 eruption was the most economically destructive volcanic event in U.S. history, costing an estimated $2 billion. #5 – Mount Pinatubo, Luzon, Philippines; June 15, 1991, VEI=6: A huge cloud of volcanic ash and gas rose above Mount Pinatubo, Philippines, on June 12, 1991. Three days later, the volcano exploded in the second-largest volcanic eruption on Earth in the 20th century. Timely forecasts of this eruption enabled people living near the volcano to evacuate to safer distances, saving at least 5,000 lives. However, thousands of roofs collapsed under the weight of ash made wet by heavy rains. Ash deposits from the eruption were redistributed by monsoon and typhoon rains to form giant mudflows of volcanic materials (lahars), which caused more destruction than the eruption itself. On June 12, 1991 (Philippine Independence Day), millions of cubic yards of gas-charged magma reached the surface and exploded in the reawakening volcano’s first spectacular eruption. When even more highly gas charged magma reached Pinatubo’s surface on June 15, the volcano exploded in a cataclysmic eruption that ejected more than 1 cubic mile of material. The ash cloud from this climactic eruption rose 22 miles (116,000 feet) into the air. At lower altitudes, the ash was blown in all directions by the intense cyclonic winds of a coincidentally occurring typhoon. A blanket of volcanic ash blanketed the countryside. Fine ash fell as far away as the Indian Ocean, and satellites tracked the ash cloud several times around the globe. Huge avalanches of searing hot ash, gas, and pumice fragments (pyroclastic flows) roared down the flanks of Mount Pinatubo, filling once-deep valleys with fresh volcanic deposits as much as 660 feet thick. The eruption removed so much magma and rock from below the volcano that the summit collapsed to form a large volcanic depression (caldera) 1.6 miles (8,500 feet) across. Note: Originally published 12/11/2011. This entry was posted in Death, Disasters, Economics, Explosions, Famine, France, Germany, Indonesia, Misc, Miscellaneous, Nature, News, United States, Volcanoes and tagged britain france switzerland and germany devestated, china suffered famine, eastern and southern europe hit by typhus and hunger, india hit by cholera epidemic, june 12 1991 philippine independence day, krakatau august 26 and 27 1883 indonesia vei=6, krakatau explosion equal to 10 hiroshima type nuclear weapons with 40000 people killed, krakatau explosions so violent they were heard 2200 miles away in perth western australia and 3000 miles away in near mauritius in the indian ocean, lesser sunda island indonesia vei=7, major volcanoes of the last 200 years, mount pinatubo ash cloud 116000 feet high, mount pinatubo luzon philippines june 15 1991 vei=6, mount st. helens cost $2 billion, mount st. helens lahars damged 27 bridges 200 homes and forced 31 ships to remain in ports upstream, mount st. helens united states may 18 1980 vei=5, pressure wave from kratatoa ruptured eardrums, santa maria october 24 1902 guatemala vei=6, santa maria volcano kills most of coffee crop and thousands of cattle and horses, santa maria was one of the largest eruptions of the 20th century, snow fell in june, tambora april 5 1815, tambora created the year without a summer in 1816, tambora exploded with a sound so loud it ws heard 1600 miles away, tambora killed 300000 people, The Master of Disaster, the napoleonic wars, vei volcano explosivity index. Bookmark the permalink.